HDFC ERGO General Insurance Company, India’s leading non-life insurer, launched the 3rd season of their Insurance Awareness Award Quiz with the Semi-Final round in Bengaluru. The team from Mt. Litera Zee School won the Semi Final round in Bengaluru city, competing against 30 schools from Bengaluru. The winning team from Bengaluru will compete against 8 school teams from Mumbai, Delhi, Kolkata, Chennai, Hyderabad, Ahmedabad, Ranchi and Pune in the Grand Finale to be held in Mumbai on 27th September 2018. 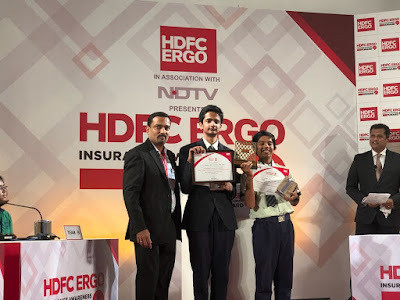 The HDFC ERGO Insurance Awareness Award Junior - Quiz is an awareness drive with the motive to take insurance knowledge among students across the country through an interesting format of a Quiz.